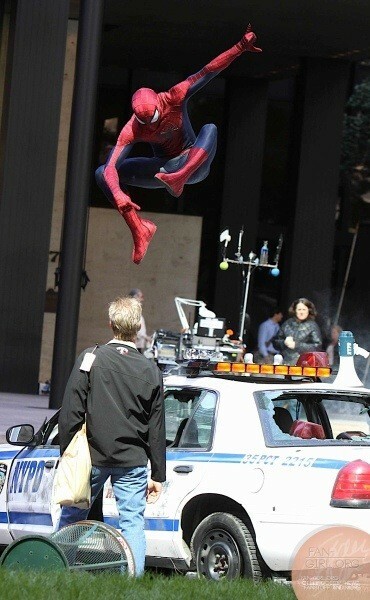 Paul Giamatti gets in a suit and Spidey has a mini-me in these new Amazing Spider-Man set pics! Ahoy, squirts! Quint here. 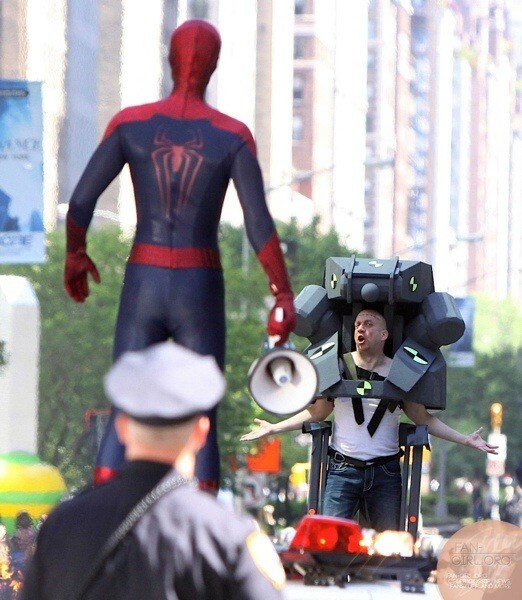 I love Spider-Man set photos. I know it must piss off the production something fierce, but getting tiny glimpses of the making of a Spider-Man movie really get my geek juices flowing. Here's the thing... when Nolan was shooting his Batman movies all over the place that was cool and all, but it was still just mostly just shots of a dude standing around in a rubber suit. 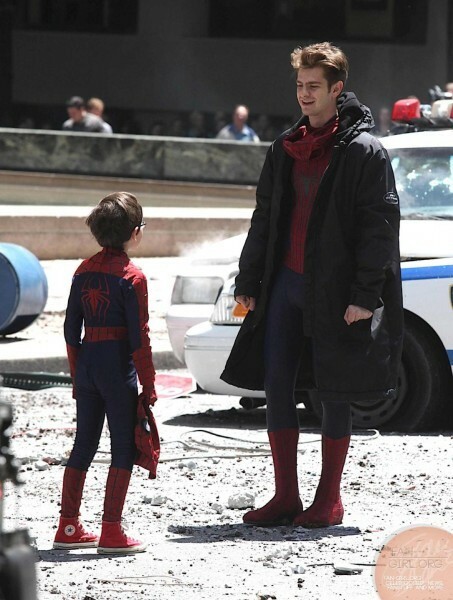 When we get Spider-Man set pics we get to see Spidey being Spidey. There's a pose that the Spider-Man stunt guy hits that almost made me squee. I know I shouldn't admit that in public, but goddamnit it did. It's the final pic in the bunch below. What's also noteworthy about these images is that we get a glimpse at... something... involving the Rhino. 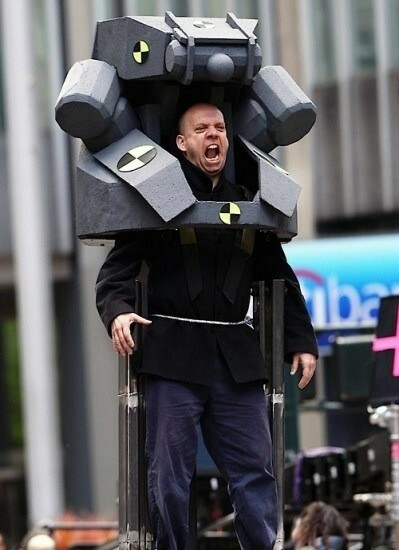 I assume it's a reference for the surely mechanical suit Paul Giamatti will wear. I was wondering if they were going to go mutant ala The Lizard, but if they were doing that wouldn't Giamatti's face be all dotted up performance-capture style? Those radiation symbol looking dots are definitely for being tracked in a computer and Giamatti looks to be acting his heart out in these images, so I'm going to venture a guess that we'll be seeing his face in this suit, however it appears via the magic of computers. 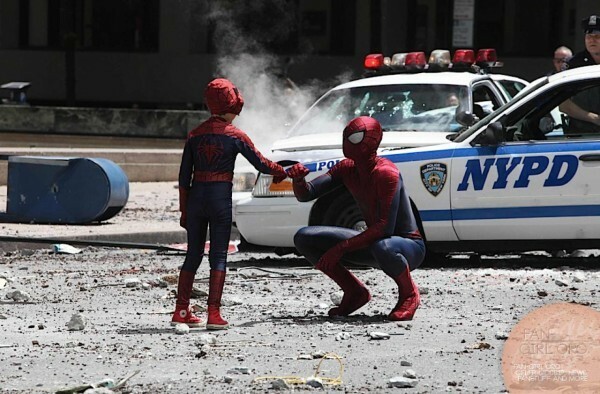 It also appears Spidey has a mini-me in this movie. I was hoping at first that it was just a kid who happened to hear the new Spider-Man was filming down the street, but I think it's all part of the scene being filmed. I've included a handful of my favorite shots, but you can see the rest at fan-girl.org. A tip of the hat to Live For Films, which is where I first saw these images. I'm super pumped. The suit's never looked better and Andrew Garfield is my favorite onscreen Peter Parker/Spider-Man. If Webb's Amazing Spider-Man turns out to be as big a step up as Raimi's second Spidey film was we're in for a treat next year.